The main Final Fantasy franchise is not particularly well known for its co-op opportunities, but the Crystal Chronicles offshoot seems to have been developed to address just such an issue. 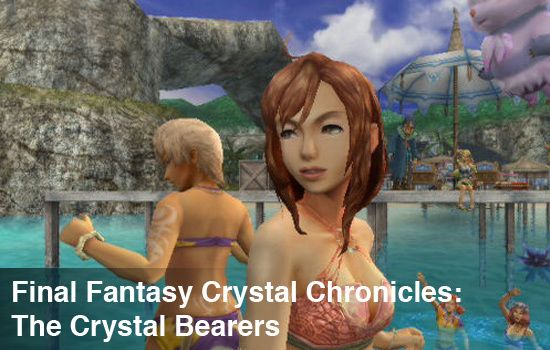 Beginning with the eponymous first game, every title in this series has featured a four-player co-op mode, with the exception of the WiiWare titles and the most recent game, Final Fantasy Crystal Chronicles: The Crystal Bearers. Was this change to “the new Coke” a good move on Square Enix’s part, or were they better off with the tried and true formula of past games? The answer to that question lies in the answer to this one: remember Crystal from Pepsi? Scrapping the familiar hack-n-slash dungeon crawler design altogether in favor of a more open world design that utilizes the Wiimote’s motion control functionality, The Crystal Bearers places players in the shoes of Layle, a crystal bearer with the ability to manipulate gravity. This manipulation occurs by locking on to a target and then waggling the Wiimote left, right, or down to jerk the object of your gravitational exploitation in the appropriate direction. By flicking the Wiimote up, you can pick your target up and then proceed to throw it into walls, boxes, enemies, or whatever else you find around you. While Layle’s ability is used in the world to solve the occasional puzzle or traverse an area, you’ll mainly be using these powers to combat the typical Final Fantasy foes. With the exception of the few boss battles in the game, the vast majority of your combat encounters will play out as follows: lock on to an enemy, flick/throw it around until it finally disintegrates into a puff black smoke, proceed to the next enemy. Rinse, repeat, and you can begin to see how a neat game mechanic quickly turns into a chore. Best of all, you do all of this with a time limit that’s not shown anywhere but is set to the quickly repetitive battle music track, which is roughly three to four minutes in length. When the track ends, your time’s up and the monsters all disappear. Don’t worry though, if you just wait around in the area for another three to four minutes, they’ll show up again. The one plus side to all of this is that battles don’t serve the same purpose as they do in most RPGs, i.e., gaining levels to make your character stronger. Instead, your fallen enemies will also occasionally drop materials that can be used to craft equipment that increases your various stats, and successfully clearing an area for the first time nets you an increase to your total health. Since various vendors in the world sell the same materials and equipment that you can eventually acquire through combating foes (and there is no shortage of chests containing pocket change), you’re fairly safe skipping many of the battles unless you really want to fight the enemies. The only real problem with skipping out on the battles is that you’ll essentially be skipping out on the portions of the game where your co-op partner has a remote chance of being helpful. You see, in Crystal Bearers, your co-op partner, as the game’s producer stated in our interview, has been relegated to the role of “assistant.” Really, that’s almost too grand of a title; “guy/gal who occasionally interacts with something” would be a more fitting, albeit longer, one. 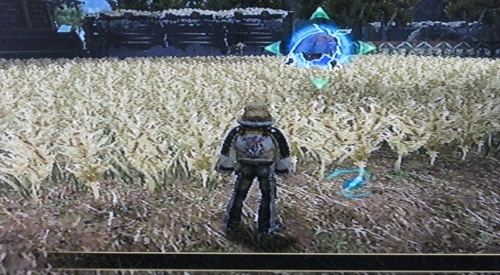 The second player in this game uses their own Wiimote and is even given their own cursor on screen (orange as opposed to the first player’s blue cursor) and can flick objects/enemies about, but overall control is left entirely in the hands of the first player. The camera follows Layle’s movements and targets, so if the first player locks on to an enemy at the edge of the screen, or an enemy moves while Layle’s locked on to it, the camera moves with it. 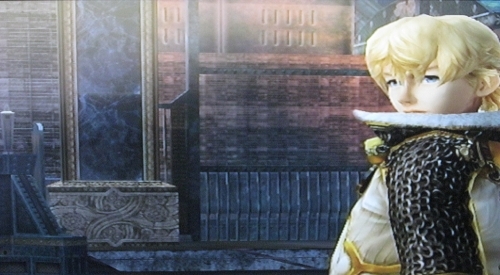 Thus, any kind of lock on an enemy or object that the second player had established is lost and they must lock onto something new; assuming, of course, that the camera hasn’t yet shifted again. What’s more, the second player can’t even grab and hold on to objects/enemies the same way that the first player can, so the only thing the second player can do is flick enemies around and hope that doing so causes them to take damage. What about the larger portion of the game when Layle’s not in combat? Well, pop some popcorn, sit back, relax, and enjoy watching the other guy play the game. On the whole, The Crystal Bearers is a game that has fairly decent control mechanics and some rather interesting focal areas as the basis for its plot, like racial discrimination and genocide, but it never fully realizes any of these things. Every time the game begins to show a little bit of depth, some dubious minigame is tossed in, or the dialogue begins to sound like an early ‘90s localization attempt, and utterly shatters any hope that there may be more here than just another story about a reluctant hero that gets roped into saving the world. Even the co-op has some potential but, sadly, it too follows the same course as the other elements of the game and quickly ends up being a jumbled mess. Trying out a new formula for a series in order to spice things up a bit and make it different is great, but just make sure the result doesn’t come out half-baked.